A true patio tomato! 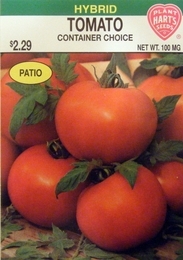 Each plant bears clusters of 5 ounce deep red beefsteak fruit in a container right on your deck or patio. The sturdy plant has excellent disease resistance and the rich tomato taste of a traditional slicer. This is a vigorous determinate plant that will benefit from support from a cage. Water and fertilize regularly and do not prune the ÔsuckersÕ. Plants will continue to produce fruit right up until frost.